Could your Instant Pot finally help you kick your microwave out of the house for good? The answer is… you bet you can! …one of the things I do the most with my Instant Pot is to reheat foods! We haven't had a microwave for years. I adjusted pretty easily to reheating leftovers on the stovetop or oven. …with none of the downsides! (I do believe it's unhealthy to use a microwave.) However, rather than get into all of the downsides today, instead I'm going to show you how to use your Instant Pot to reheat foods. It's fast and so easy! How do I reheat food in an Instant Pot? Can it possibly replace my microwave so I can finally get rid of that unhealthy appliance? Liquid — There should always be some liquid present. This can be in the dish itself (such as a stew) or by adding a few tablespoons (like to pasta that you're reheating). If you're stacking multiple containers inside and using the Steam function, make sure that a cup or two of water are inside the insert pot. Fat — Some foods will re-heat best with added fat (such as grains or pasta). So add a tablespoon or so for reheating. Clean-up and serving will go much easier! Containers — For single dishes, the insert pot is the reheating container; for multiple dishes, use stacking containers or glass bowls on top of the trivet. (This principle is called Stacking and we discuss it more in our Pressure Cooking eBook & Video Package. Separators Between Containers — Stacking containers are designed to separate themselves; if you're cobbling together various containers from your kitchen, put hard items such as trivets in between them so they don't collapse on each other. Covers — For multiple dishes, each container should be covered to maintain separation. Stacking containers are designed with covers; otherwise, use pot lids or parchment paper/foil. Cooking Times — Foods that need longer cooking times go on the bottom. More tender foods (like noodles) need less re-heating time. Frozen foods need more re-heating time than unfrozen. Now here are instructions for how to use each function to reheat food in the Instant Pot. This is the function I use most often. Remember to have some liquid (and fat if it's a food that will stick otherwise) with each dish — either in the dish itself or added dishes. And, if you're stacking multiple containers inside, make sure that a cup or two of water are inside the insert pot. Put the food in the Instant Pot (single or multiple containers such as this 7-cup pyrex bowl or stacking containers like this). Put the regular lid on, and put the venting knob in the sealing position. Press the Steam button. Adjust the time up or down accordingly. Usually, 5 minutes is about right for most non-frozen cooked dishes you're re-heating, from a grilled salmon fillet to leftover stew. Noodles need 1 to 2 minutes. When the cooking time is complete, quick release pressure. Check dishes to see if any need more time (if so, repeat steps with a few more minutes reheating time). When the dish(es) are ready, serve! Sauté Function — Add a tablespoon or two of liquid (and fat if the food is sticky) to the insert pot. Add leftovers to the pot. Press the Sauté button. You can also warm soups this way; just make sure to watch the pot and stir the soup frequently while it re-heats. Use the glass lid as needed. Slow Cook — Use this feature to re-heat soups, casseroles, sides, and even rolls or bread that you would normally bake to warm up. You put them either in the insert pot itself (soups) or in a container inside (rolls). Timing is equal to what you'd normally do in a slow cooker; it's on the slower side. Use the regular lid or glass lid to cover the dish while it's reheating. Keep Warm — This is great for casseroles or baked dishes, especially when you want to warm them more slowly. Put the food in the pot or inside a container in the pot. Press the Keep Warm Button. Use either the regular lid or glass lid to cover the dish while it slowly re-heats. Want To Do More With Your Instant Pot? Be sure to download my free Instant Pot sourdough cornbread recipe right here! For more information on stacking and pressure cooker recipes galore (all Instant Pot-friendly), check out my Pressure Cooking eBook & Video Package. Stainless Steel Stackable Pans — use code 10OFF4WARDEE to get 10% OFF (must be from seller Me'n Lily). Did you know you could reheat leftovers in the Instant Pot? Have you tried it yet? I love my instant pot! I just normally put whatever I want to warm up in the pot with a little extra water (unless it soup! ), and set it on manual for 1 minute. But I’ll have to check out your suggestions and maybe get the glass lid. Do you have a traditional pressure cooker? They are actually faster (higher pressure) and probably available for much less $$$. 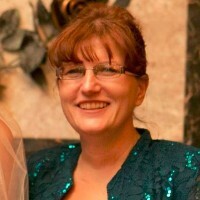 Hey there, I’m also in Australia. I bought mine from Amazon UK (got here so quickly) and they have the same voltage so no issues. I just used a standard kettle cord with it from another appliance. Love it and use it several times a day. Thanks Wardeh!! I got an Instant Pot 2 months ago & have been slow learning to use it. This video has been a huge help! Thank you for the article. Quick question, does the pyrex bowl need to be oven safe? Because the product you shared on amazon is not over safe (though it is microwave safe). I just joined TCS on Thursday, but I have been using the instant pot for over a year. I was excited to see your video on how to replace my microwave with the instant pot! If you aren’t suppsed to eat oil due to bad arteries, are there other ways to still use this insta-pot without adding oil? Olive oil and coconut oil are good for you and will not “clog” your arteries. Hi, is it possible to say heat a cup of tea (in a tea cup) in instaPot? Or heat up milk for cereal for instance? So if I want to heat up fish I need to add water? Doesn’t that make the fish soupy? Could I heat up a cup of coffee in a cup on the rack inside the pot or do I need to dump the coffee in the pot? The only thing I really could see as an issue if I give up my microwave!!! If I store leftovers in the stainless bowl, is it ok to take it right from fridge to instant pot even though the bowl is cold? Thanks! How about frozen burritos? do I wrap them in foil before reheating them on the rack. Would a bit of water and High pressure 1 minute be enough? We haven’t done this. You could test one by using the “pot within pot” method and covering the burrito in a bowl and setting it on the trivet. Put water in the IP insert pot and use the steam function. If the bowl with the burrito is covered well, it might not get soggy. Using steam it will likely take longer than one minute. You’ll have to play with the timing. How does your son heat his burritos for breakfast? I was thinking of making frozen burritos for my husband, but not sure the best way to reheat. We have a microwave, toaster oven and instant pot. We don’t recommend using a microwave. As Millie stated above, we haven’t tried reheating burritos in the Instant Pot. You could test one by using the “pot within pot” method and covering the burrito in a bowl and setting it on the trivet. Put water in the IP insert pot and use the steam function. If the bowl with the burrito is covered well, it might not get soggy. Using steam it will likely take longer than one minute. You’ll have to play with the timing. I love hodgepodges, so I added to the IP a whole bunch of buckwheat groats (cooked from scratch last night in IP first using saute to brown the ginger/garlic/onion combo and then added the cleaned grains and DIY broth and it cooked up great and tasty) and chick pea & sesame soup I had made and tossed in a thawed (in fridge) piece of sockeye salmon (Costco) and 1 cup of broth and did steam for 8 minutes and let it natural release for 20 minutes maybe and it was hot and delicious. I put the pot with leftovers in fridge and will add more chickpea/sesame soup to it tomorrow. Fantastic! Thanks, Wardy, for the great information! The pot-in-pot method for reheating food in the IP really appeals to me, but I wanted to ask about the various containers that are available – specifically the lids. Can I use and stack, for example, several pyrex dishes with their plastic lids? Does it matter what the lids are made of? You mention using parchment paper and tinfoil, but if I have lids (either plastic, rubber, silicone or metal) for a container, can I use those instead? You can only use lids that would are oven-safe. Most plastic lids would not do well. Exactly what is unhealthy about microwaved foods? If you’re talking aboit nutrient loss, there are methods to deal with that and I’m not sure this is a major consideration for cooked food thats just being reheated. We believe that the manner in which a microwave heats food — whether or not it’s cooked already — denatures the food and is not healthy. Can I mix the containers and have one for the sour dough bread and one for a dish starting w/ raw meat and a third for reheat? Perhaps put them so the shortest cooking item is on top and easiest to remove and so on. Would that be possible? Thanks. Do I need to add water if I’m reheating cooked chili? if yes, how much water? Thanks. If you are steaming, as Wardee demonstrates in the video using a separate dish, you’ll need to add water as Wardee shows in the video. If you are using the saute feature, you may or may not need water depending on how thick your chili is and how thick you wish it to be. The saute feature is very much like reheating on the stove. This is the setting I use for something like chili. It reheats without rapidly cooking. You could use the pressure cook feature. This will cook the chili as well as reheat. If you have beans in your chili they could end up mushy using this. If you use pressure, you may need to add water if your chili is too thick. How much will depend on how thick your chili is. You should refer to your manual for the amount of liquid recommended. Thank you Millie. This will be my first time using the Instant pot for reheating cooked food. I think I like the saute feature you suggested. Thanks. What would I need to do to reheat a whole tenderloin? Thank you this is going to give me more help using my new cooker. What makes you think microwaves are unhealthy? We believe that the manner in which a microwave heats food, whether or not it’s cooked already, denatures the food and is not healthy. I just tried your method to reheat some Bean Soup. I put the cold soup into 2 Pyrex soup cups, covered them with foil, and placed them on the trivet in my Instant Pot. I added 1 1/2 cups of water to the liner and set the IP to 8 minutes Steam. After a 10 minute Natural Release (on Keep Warm), my soup was only 135 degrees. I had to steam it for an additional 8 minutes, and the temperature was then 182 degrees. I thought this was only going to take 5 minutes on Steam to reheat? Any idea what I could have done wrong to make it take so long? I’m wondering if the pot wasn’t sealed properly or if the density of ingredients that prevented it from heating? Also, perhaps using two glass bowls was an issue. I’ve never needed to heat soup more than 5 minutes and I’ve often “forgotten” it for awhile on Keep Warm and have still have nice, hot soup. I could tell that the pot was sealed properly because the pressure valve had risen all the way. I guess I don’t understand why 2 ramekin type cups would be an issue, but I’ll try it in one container the next time. I think I must have done something fundamentally wrong but I appear to have followed your procedure to the letter and have ended up with something completely stone cold. I put the stew into a ceramic ovenable bowl covered with foil onto the trivet inside the instant pot with a cup of water in the bottom. I set the instant pot to steam for 5 minutes. At the end of the time, when I took it out the stew was completely stone cold. I then repeated for another 5 minutes but the stew is still completely cold. Is there anything you would recommend I check to see what I am doing wrong? I reheat my soups and stews in the Instant Pot often and have never had stone cold soup. What would be the best method for reheating beef short ribs that were previously cooked in the Instant Pot. I have the ribs sitting in their original liquid, perhaps add more if it gets too thick… Would Steam be best or would the ribs get tough if I pressure cooked again on the Meat/Stew function? I am afraid of making the meat too tough or rubbery. Thanks! Based on the instructions in the post, I think the Steam function would be best for reheating beef short ribs. And yes, I would add a bit of liquid if the original is on the thick side. Pressure cooking again on the Meat/Stew function would likely do as you have suggested — make the meat tough. Sticking with Steam is your best bet! This is such a great guide! 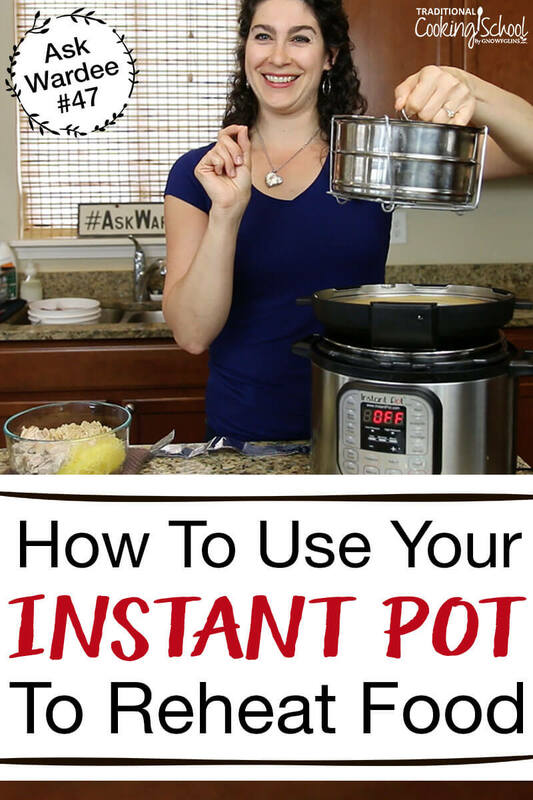 I’ve included it in a post I wrote about Instant Pot Tips! Thanks so much for all the information. I tried the pot in pot method last night with the stackable containers. I had mashed potatoes in the bottom container and shredded chicken in the top container. I added a little oil and water to both containers. In the instant pot insert I added 1 1/2-2 cups water. I set it to steam for 5 minutes and then I did a quick pressure release. When I opened the containers the food was lukewarm ;( What did I do wrong? Did I need to use the trivet in the insert pot? Let pressure release naturally? Less water in insert? Was the food cold out of the refrigerator? I found for mashed potatoes I need to do 6 minutes. Also, try putting the potatoes on top and the chicken on the bottom. Yes, it was cold from the fridge. Next time I will increase the time. Quick pressure release is okay? Yes, quick pressure release is okay. Hello. I am surprised that you recommend aluminum foil to be used inside an Instant Pot pressure cooker as a cover or “strap”. Aluminum exposure can lead to birth defects, neuro-degenerative disease, several forms of cancer, bone disorders, and autoimmune disease. If you are not aware of this information on aluminum, it is readily available on the Internet. You are right, and we do not want foil to come into contact with food. The sling is not to contact the food, and the food is to be covered. And when we recommend using foil as a covering it is only after parchment has been placed over the food. Thank you for all this info! My microwave stopped microwaving today! Regarding the sling made of tin foil, is it really necessary to use with the 7 cup pyrex bowl? Wouldn’t it be easier to sit the bowl on the trivet which has handles during the steam reheating process?